Motto as Archbishop: Miserando atque eligendo/Miserable yet chosen. Jorge Mario Bergoglio was born on 17 December 1936 in Buenos Aires, Argentina. He was ordained for the Society of Jesus (Jesuits) on 13 December 1969 during his theological studies at the Theological Faculty of San Miguel. As served as a novice master in San Miguel, where he also taught theology, and later was the Jesuit Provincial for Argentina (1973-1979) and Rector of the Philosophical and Theological Faculty of San Miguel (1980-1986). After completing his doctoral dissertation in Germany, he served as a confessor and spiritual director in Córdoba. On 20 May 1992 he was appointed titular Bishop of Auca and Auxiliary of Buenos Aires, receiving episcopal consecration on 27 June. On 3 June 1997 he was made Coadjutor Archbishop of Buenos Aires and succeeded Cardinal Antonio Quarracino on 28 February 1998. He is also the Ordinary for Eastern-rite faithful in Argentina who lack an Ordinary of their own rite. From 8 November 2005 until 8 November 2011 he served as President of the Bishops' Conference of Argentina. He was created and proclaimed Cardinal by Bl. 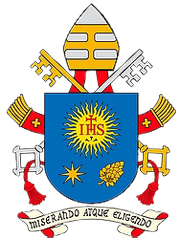 John Paul II in the consistory of 21 February 2001, with the Title of S. Roberto Bellarmino (St. Robert Bellarmine). During the 10th Ordinary General Assembly of the Synod of Bishops, in October 2001, he served as the Adjunct Relator General. He was also a member of several curial congregations: For Divine Worship and Discipline of the Sacraments; for the Clergy; for Institutes of Consecrated Life and Societies of Apostolic Life, as well as the Pontifical Council for the Family and the Pontifical Commission for Latin America. 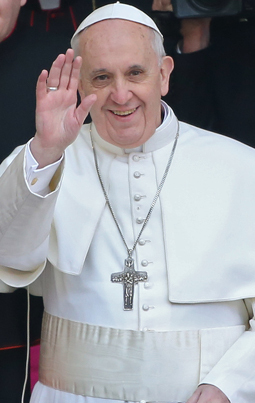 On 13 March 2013 Jorge Mario Bergoglio, SJ, was elected Supreme Pontiff on the second day of the Conclave, on the fifth ballot. O God, who in your providential design willed that your Church be built upon blessed Peter, whom you set over the other Apostles, look with favor, we pray, on Francis, our Pope and grant that he, whom you have made Peter's successor, may be for your people a visible source and foundation of unity in faith and of communion. Through our Lord Jesus Christ, your Son, who lives and reigns with you in the unity of the Holy Spirit, one God, forever and ever. Amen.